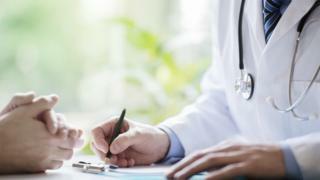 Almost 95,000 people in Northern Ireland are waiting more than a year for a first consultant-led appointment. That is according to new figures released by the Department of Health which show the position at the end of December 2018. It represents a rise of more than 17% compared to December 2017. Government targets require that no patients should be waiting longer than 52 weeks for treatment. The Department of Health said that while fundamental transformation remains the only long-term answer, sustained investment is also required to clear the backlog of patients waiting for treatment. Overall, more than 280,000 people are waiting for a first appointment with a consultant. In December 2017, the number of people waiting was 271, 553. Waiting times for inpatient treatment have also risen with 21,477 patients waiting more than a year for inpatient treatment. That's a rise of almost 43% compared to December 2017. Nick Menhirick has been waiting almost three years for an operation on his feet. Last week, he was given a date for his operation. His health trust has arranged for his operation to be done in a private hospital, however, he's been told that complicates arrangements for his aftercare package which will be delivered by the health service. "Because I live on my own I need an aftercare package, but as there are waiting lists for them that may affect the date I go in for my operation," he said. John Crawford Baker was told last week his cataract operation will be taking place in Downpatrick. The problem is that from his home in Island Magee to the Downe hospital is a round trip of around 100 miles - a trip he's feels he shouldn't have to make . But a Department of Health spokesperson said that elective care centres, like the Downe Hospital, which are separate to large acute hospitals are a central part of reducing waiting times. "We believe the vast majority of patients will see any additional travel time as a price worth paying for more timely treatment," said the spokesperson. Mark Taylor is the director for Northern Ireland at the Royal College of Surgeons. He said there is overall agreement that such figures are totally unacceptable and that transformation is the only answer. "Our health services need the resources to close the gap between growing demand and the capacity of the system to meet that demand," he said. "This requires sustained and guaranteed investment over a number of years. "It also means radical transformation of the way we deliver services which will require two elements - sustained funding push to reduce waiting times and eradicate the backlog of people waiting to stabilise the current situation and a longer-term strategy to tackle the capacity gap and prevent future backlogs." He said no-one should underestimate the scale of these challenges. "This year, a £30m package was provided to reduce waiting lists. This has funded assessment and treatment for significant numbers of patients. "Health and social care staff are working very hard to ensure waiting lists don't fall any further behind, but without political support and the required funding to bring about the changes needed, it will be very difficult to get our health service back on an even footing."